Regular readers will know from past posts such as Ballymacaw, Portally, and Whiting Bay that when I am swimming a new location by myself, I try to understand as much as I can before I get in the water. When swimming a new location, it’s always well to remember my safety motto: The best safety decisions are made outside of the water. Ardmore is a small and very pictureesque seaside village in west Waterford. 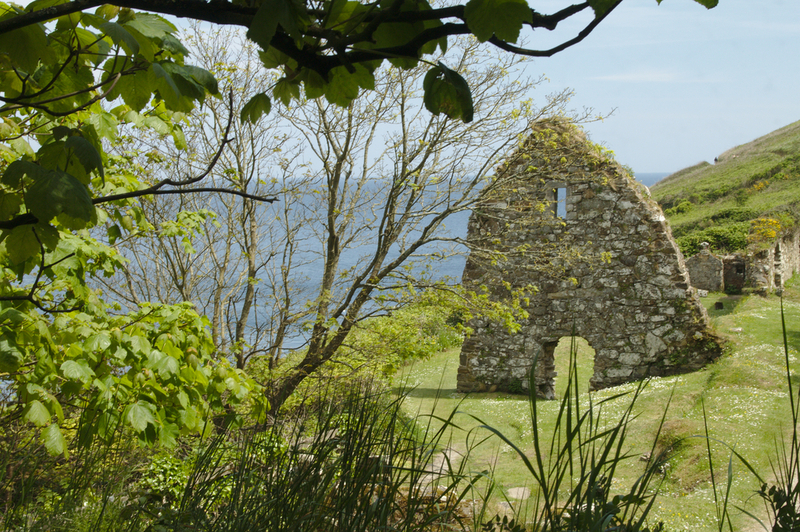 It has previously won Ireland’s Tidyiest Village awards on a few occasions, and was the site of Ireland’s first Christian monastery 1700 years or so ago. The village is nestled into the west side of the bay under Ram Head, to provide protection from the prevailing south-westerly winds. Ardmore literally means the big height. The bay itself is shallow and there is no protective natural boat harbour (apart from a small concrete pier, with water too shallow for fishing or large boats). It was a public holiday weekend and the Sun was shining and the day was warm. That’s consequential. We’ve had no summer to speak of for a couple of years and have just exited the coldest and most protracted spring in over sixty years. Meteorological reports of 2012 showed it started raining in early June and there was NO sunshine after that. Cold, wet and grim. Sunshine is therefore the rarest treat. Ardmore is about an hour away from home, a bit too far for regular open water swimming trips. I wanted to take a close look at the route again before I’d swim it later in the summer. 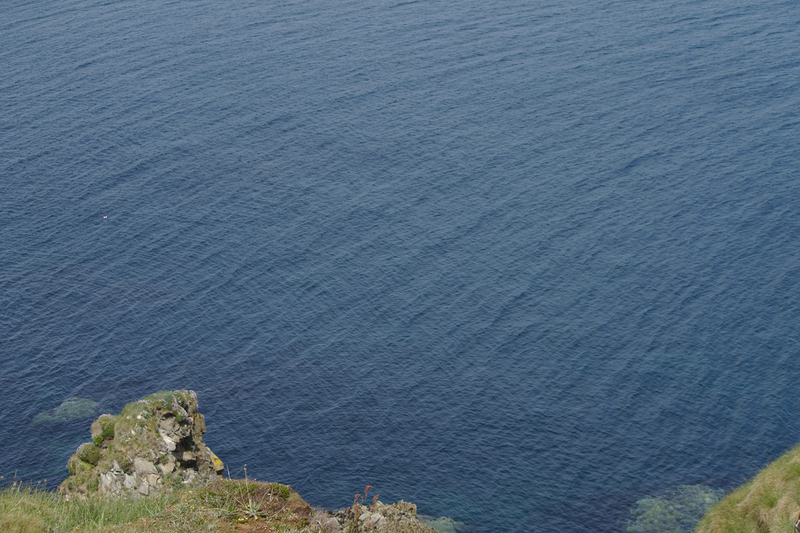 The potential swim is out of the shallow bay out along to the headland where it’s possible to climb down the rocks which are a popular sea angling location, around the headland and past another to the slight cove with the wreck, about 700 metres further. Refraction patterns. Click for large. From above on the cliff, with a light Force two breeze the water surface was merely rippley. The south westerly breeze was creating interesting refraction patterns around the headland. The cove which contains the Samson is slightly more protected by another headland and the wreck itself if at the cliff base. A protected path runs in a large circle past the Cliff House hotel, past the ruins of St. Declan’s Monastery, around the outside headland past the World Ward II (The Emergency as it was known in Ireland) around the back of the town past the Round Tower from the days of Viking depredations. We moved the car down to the slipway and I quickly grabbed a chocolate bar as a pre-swim snack. My final instructions to Dee, since I’d had a good look at the water included a 90 minute cutoff. I entered the flat cool water, about the same temperature as Sandycove the previous day. Dee would have to walk back up the hill, pass the hotel and out onto the cliff path. I was past the hotel quickly and through the buoy moorings. I stopped after ten minutes to see if I could see Dee on the path. Not wearing my glasses and there’s being plenty of people walking, I couldn’t see her. 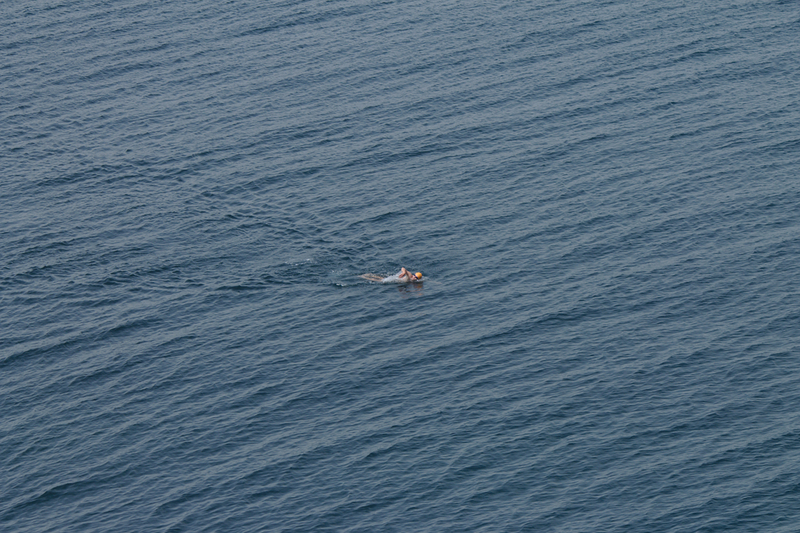 I swam on and stopped before the headland, when I could see someone frantically rushing. For once I’d managed to travel quicker. I didn’t swim as close to the rocks as I’d expected due to the presence of a few sea anglers. I could see constant interest from people stopping on the cliff. As soon as I rounded the headland, there was a bit of swell, only about half a metre though and I didn’t feel slowed down. The photo though is interesting, showing divergent wakes behind me, one from swimming, one from wave interference. The glare was stronger and I couldn’t see anything in front of me but I knew I only had to pass the next surface rocks to reach the wreck cove. Another ten minutes and I was only able to make out the wreck by removing my goggles. I decided to approach from the far side to reduce the glare and I was at the wreck at about thirty-five minutes from the slipway. The path above the wreck is further inland due to a steep slope down, and I’d told Dee she would have to stay a couple of hundred metres back on the path to see me. Remains of the Samson. Mine Head, site of Ireland’s highest lighthouse is in the far distance. 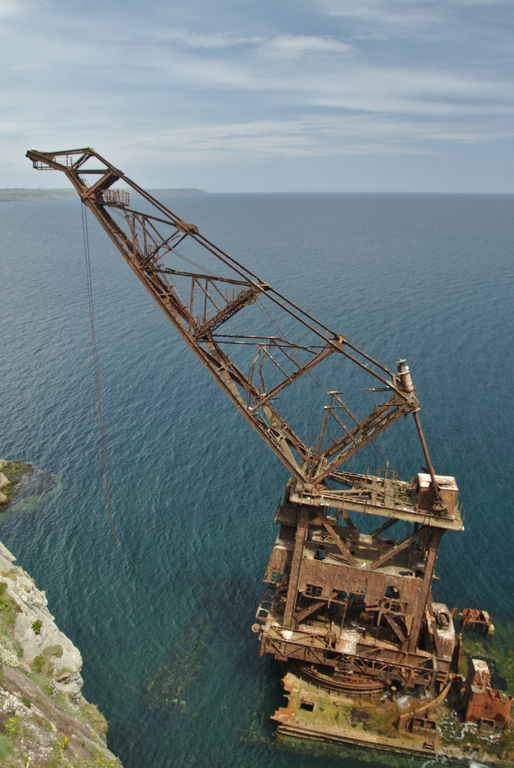 The Samson was a crane barge. In December of 1987 it was being towed from Liverpool to Malta when a storm cut her loose with two crew from her tugboat off the Welsh coast. 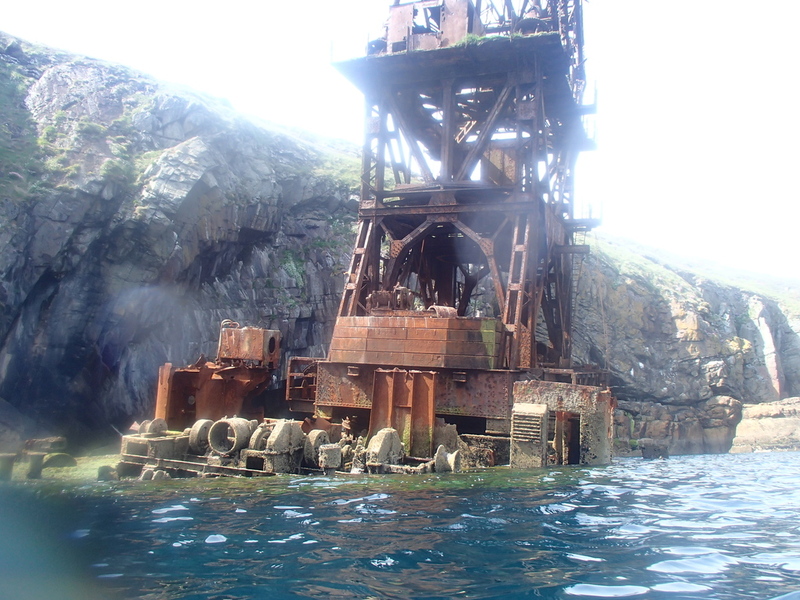 the crew were rescued and she eventually crashed a couple of hundred miles away on the Ram Head rocks and has been rusting away ever since. Under the cliff’s shelter the water was clear and cold and the direct overhead Sun made in-water photographs difficult. There are some interesting looking caves for future swims. 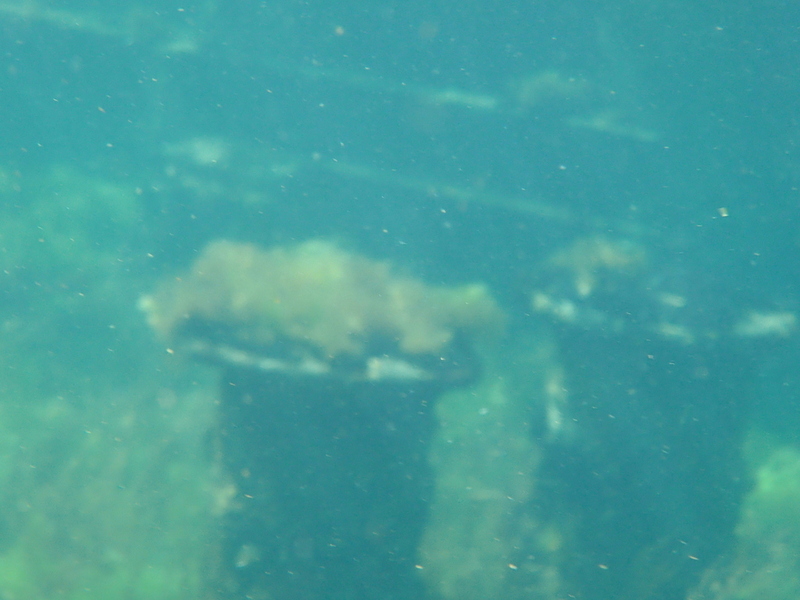 I spent about five minutes swimming around and taking shots as I cooled and then I struck out for the return. After I rounded the angling rocks again, the flatness of the water was a rare treat and I sprinted for the slipway, an uneventful final stretch and I cruised onto the beach after 65 minutes, about 30 seconds ahead of Dee. 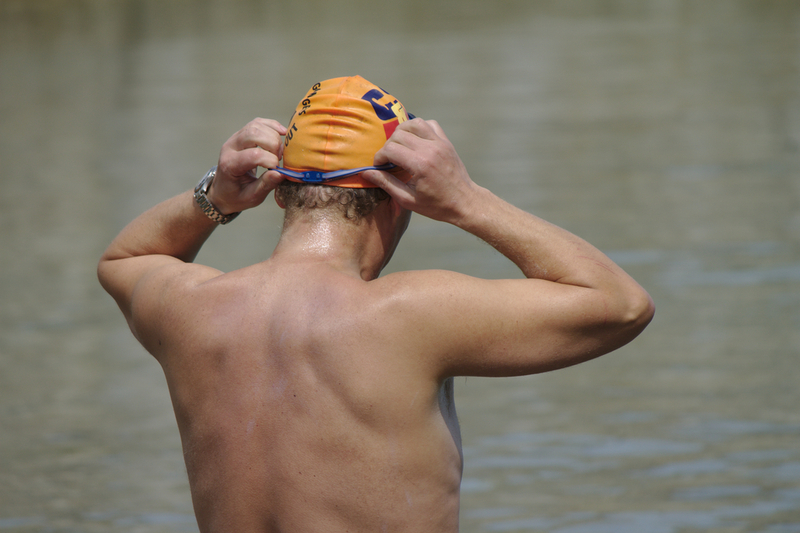 ← Should slow swimmers have the right of way in lane swimming? Really? Must be some interesting currents around the headland. Can you research those or ask locals for knowledge? Just wondered about the best approach. Well I have my own knowledge & experience of swimming the south-east coast, overall maps, plus I’d visually inspected the route. Where possible I will ask locals who have useful input. Yeah its amazing what you don’t see:-) Definitely caves are a lot of fun. Have been through that one around the corner from Newtown in less than ideal conditions. Really teaches you to not fight the water and just go with the flow. They can be really peaceful too I’ve noticed. That sounds amazing. There’s something foreboding about caves it really does feel like you are entering a different realm, the echoes and booms are an experience. There’s a small one just outside of Newtown Cove which you can swim through and then left and out the other side. There’s a large boulder and gap at the bottom before the turn which I swam through last year… edgy to say the least, but yes your right it does keep you going. Would you believe I only saw that one outside Newtown Cove last year after swimming past what must be hundreds of times? 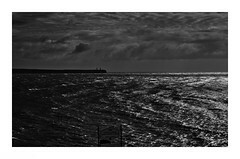 I tend to prefer out deep, and one day I decided to noodle along the whole coast, when I realised. There’s another further out before The Chair, but you can only swim into it on a high flat spring tide, and it’s dull anyway & full of boulders. The Comolees used to a cave until about 50 years ago apparently. Very cool! 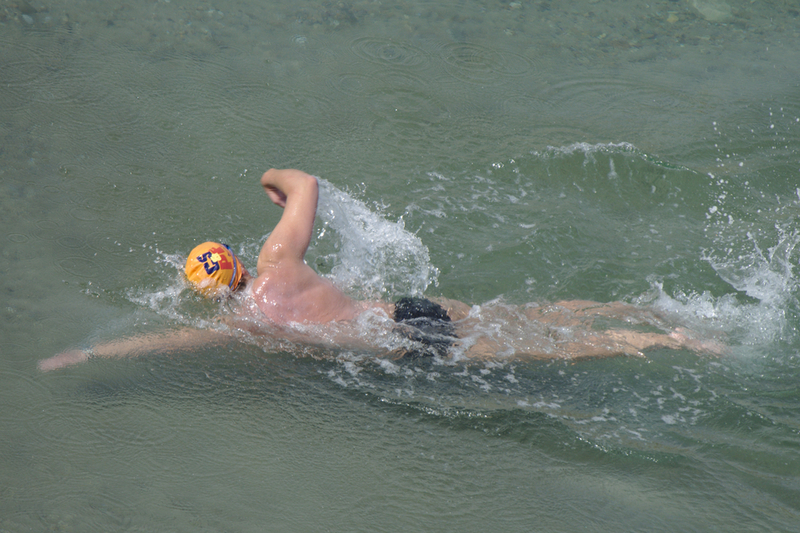 Do you find these exploratory swims sometimes daunting? Swimming towards the Samson wreck looks formidable. It helps to do it on a nice day like this! Yeah, sometimes I can get a bit edgy, that’s what makes me keep doing it. 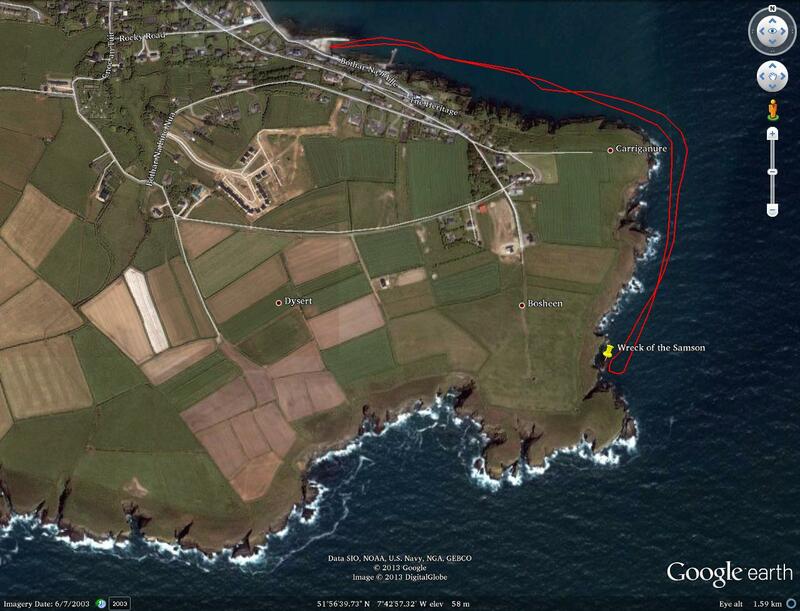 Swam out of Portally last Saturday, very strong tide running in the opposite direction this time, west toward Tramore. Swam about 1k to Seal Cave, which I’ve passed before, but this time swam into it. It’s marked on the OS maps. Wow, that’s the biggest cave on the entire Waterford coast. The main outside cave leads further back, I don’t know how deep, through a relatively narrow (2 metres?) but high entrance. I decided to leave that for another day, I progress in small increments. The easy way to swim the Samson is walk out the path and enter at the angling rocks. Less than 10 minutes from there.